Climate justice and sustainable management of the planet’s resources must be at the centre of the Post-2015 sustainable development framework, according to a declaration by the West African civil society organizations on climate change. Developed countries are also being held to continue to commit and deliver on providing financial and technological resources to address mitigation and adaptation challenges in line with the principle of common but differentiated responsibilities. CSO representatives from Nigeria, Ghana, Liberia, Sierra Leone, The Gambia, Togo, Mali, Cote D’Ivoire, Benin, Niger, Burkina Faso, Guinea and Mauritania convened at the West Africa regional civil society capacity building workshop on Climate Change and Post-2015 Sustainable Development Agenda in Lome, Togo. The Post-2015 Development Agenda is the future global development framework to succeed the United Nation’s Millennium Development Goals which ends in 2015. The impacts of climate change continue to exert great economic, social, political and cultural pressures on households, working families, the poor, rural and urban dwellers. These pressures have a combined effect of reducing opportunities and potentials for attaining progress and prosperity in communities. The civil society groups emphasized the need for Africa to begin to focus on generating its own funds in order to finance climate change programs and activities, whilst CSOs increased efforts to monitor and track climate change budget provisions and performance. “West African CSOs should continue to engage their governments to find alternatives to financing climate change such as the adoption of the Financial Transaction Tax (FTT) and taxes on luxury imported goods and services”, said a Statement issued at the end of the meeting. They also called for the promotion of women’s rights, gender equality and the empowerment of youth and vulnerable groups must be given top priority. “We take advantage of the strengths and opportunities in new and emerging social media, to mobilize our people in both rural and urban areas, including the youth, women, artisans, in order to address climate change challenges affecting our people”. 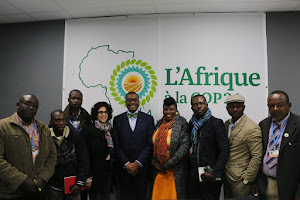 It was also declared that African CSOs in collaboration with other members of the global climate justice movement work to intensify campaigns and research in order to strengthen international coordinated action on climate change. The Lome meeting was organized by the Pan African Climate Justice Alliance (PACJA), in collaboration with the Fellowship of Christian Councils and Churches in West Africa (FECCIWA).